Harvard Medical School is part of Harvard University. The goal of all Harvard Medical School publications is to bring the public, around the world, the most current practical, authoritative health information, drawing on the expertise of the 8,000 faculty physicians at the Harvard Medical School and its world-famous affiliated hospitals. MARC B. GARNICK, M.D., EDITOR IN CHIEF, is an internationally renowned expert in medical oncology and urologic cancer. He is the Gorman Brothers Professor of Medicine at Harvard Medical School and the Beth Israel Deaconess Medical Center, where he also maintains an active clinical practice. He has dedicated his career to the development of new therapies for prostate cancer. 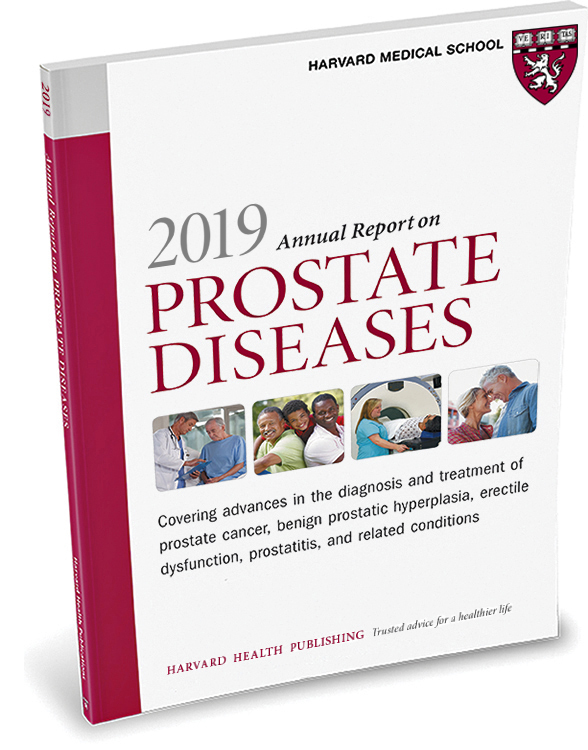 The Annual Report on Prostate Diseases, formerly Perspectives on Prostate Disease, emerged from Dr. Garnick’s keen interest in explaining issues of medical importance to patients and their families to help them select appropriate treatments. He has authored numerous scientific articles and reviews on clinical research, drug development, and cancer biology, and has written or edited six books, including A Patient’s Guide to Prostate Cancer. He served as the initial academic principal investigator for the commonly used prostate cancer drug leuprolide (Lupron). In addition to his academic affiliations, Dr. Garnick founded the Hershey Family Foundation for Prostate Cancer Research at Beth Israel Deaconess Medical Center, serves as medical adviser to World Book Encyclopedia, and is an active advisory member of several FDA panels and advisory committees. He has served on the boards of trustees of the Perelman School of Medicine at the University of Pennsylvania and Penn Medicine. Dr. Garnick is also a trustee emeritus of Bowdoin College in Brunswick, Maine. PER-ANDERS ABRAHAMSSON, M.D., PH.D., is the immediate past secretary general of the European Association of Urology, the leading professional organization overseas. He is also the former chair of the Department of Urology at Lund University Hospital in Malmö, Sweden. The author of numerous scientific publications, he serves on the editorial board of several scientific journals. He has received a number of national and international awards, and is the organizer of international conferences that bring physicians together from multiple disciplines. WILLIAM C. DEWOLF, M.D., is a professor of surgery (urology) at Harvard Medical School and chief of the Division of Urology at Beth Israel Deaconess Medical Center in Boston. Dr. DeWolf is a past member of the editorial board of Urology and is the author of numerous original reports, abstracts, and review articles published in peer-reviewed journals. A member of many professional societies, Dr. DeWolf has pursued such areas of research as the identification of urinary biomarkers for prostate cancer and the molecular biology of prostate cancer. RAVI KACKER, M.D., is a urologist and part-time instructor at Harvard Medical School. He is an active scientific researcher with several publications in the areas of testosterone, prostate and testicular cancer, enlarged prostate/BPH, and kidney stone disease. His clinical interests center on low testosterone and metabolic disease, erectile dysfunction, pelvic and testicular pain, prostate cancer, and lower urinary tract symptoms. IRVING KAPLAN, M.D., is an assistant professor of radiation oncology at Harvard Medical School and a staff radiation therapist at Beth Israel Deaconess Medical Center. His research interests include image-guided radiation therapy, brachytherapy, and molecular predictors of tumor response. In addition to publishing widely in the area of prostate disease, he is a member of the Kidney Cancer Program and the Prostate Cancer Program at the Dana-Farber/Harvard Cancer Center. KEVIN R. LOUGHLIN, M.D., M.B.A., is a professor emeritus of surgery (urology) at Harvard Medical School. He has served as a trustee and vice president of the American Board of Urology and as the New England section representative to the American Urological Association board of directors. His clinical interests include urologic oncology and urinary incontinence. He has published over 250 articles in scientific journals and has served on multiple editorial boards. He is the author or co-author of several books, including 100 Questions & Answers About Benign Prostate Disease and the Clinical Guide to Prostate Specific Antigen. MIGUEL SROUGI, M.D., PH.D., is a professor of urology at the University of São Paulo Medical School and director of the Urology Division of the Hospital das Clínicas, University of São Paulo Medical School. He has written nearly 600 research articles and over 180 book chapters focused on prognostic factors and natural history of urologic cancers and their surgical treatment. Dr. Srougi has received 58 awards and honors in the medical field, including the Conrado Wessel Prize of Medicine in 2011. He was included on a list compiled by Época magazine of the 100 most influential Brazilians in the years 2012 and 2013. CORA N. STERNBERG, M.D., F.A.C.P., is Professor of Oncology and Chief of the Department of Medical Oncology at the San Camillo–Forlanini Hospital in Rome and adjunct professor at La Sapienza University, in Rome, and Tufts University School of Medicine in Boston. Principal investigator for numerous studies and an internationally respected researcher, Dr. Sternberg received the 2013 ESMO Award from the European Society for Medical Oncology. She has served as the scientific coordinator of many international conferences and is the lead author of many journal articles. In addition, Dr. Sternberg has written or co-edited several medical textbooks. ANTHONY L. ZIETMAN, M.D., is the Jenot and William Shipley Professor of Radiation Oncology at Harvard Medical School and a radiation oncologist at Massachusetts General Hospital. A past chair of the American Society for Radiation Oncology, Dr. Zietman is a former trustee of the American Board of Radiology. His research interests include the roles of active surveillance, brachytherapy, hormone therapy, and proton beam therapy in the treatment of prostate cancer. Dr. Zietman has authored many articles and reviews on various aspects of genitourinary cancer. He is now the editor in chief of the International Journal of Radiation Oncology, Biology, Physics.